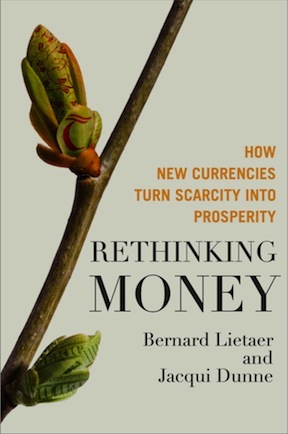 A free live presentation and book signing by Bernard Lietaer and Jacqui Dunne on their new book, Rethinking Money: How New Currencies Turn Scarcity into Prosperity will be held on March 2nd at The Performance Space at Eldorado from 2-6:00 p.m. Be part of one of THE most important conversations of the year here in Santa Fe. Communities, businesses and governments around the globe are reconsidering the concept of money. In Rethinking Money, Lietaer and Dunne explore the origins of our current monetary system, built on bank debt and scarcity, revealing the surprising and sometimes shocking ways its unconscious limitations give rise to so many of our current and serious problems. They will offer real world examples of ordinary people and their communities using new money, working in cooperation with national currencies, to strengthen local economies, create work, and beautify cities. To watch a 3 minute clip on Lietaer go to https://vimeo.com/41960492. As part of this event, a sneak preview of Money & Life by filmmaker Katie Teague will also be shown. To watch the trailer and learn more about the film, go to www.moneyandlifemovie.com. Contact Norma Tarango @ tarango.norma@gmail.com for more info. No RSVP required. Then, at 8 pm, Join us for Nosotros and Salsa Dancing! The Eldorado community is eager to initiate what we hope to be the first of many Salsa Nights at the Performance Spot this Saturday, March 2nd. An introductory salsa class will begin at 8 pm with live music by Nosotors to follow. Nosotros is a fabulous, local Latin band that has been playing in and outside of New Mexico for many years. Nosotros plays a variety of Latin music influenced by Salsa, Cumbia, Cha-Cha, Rock and Jazz. Please join us to support our local businesses and to have a hot, fabulous evening of dance and Latin rhythms!! This entry was posted in educational events, live music, Performing Arts and tagged Bernard Lietaer, Jacqui Dunne, new currencies, nosotros, Rethinking money, salsa dancing, The Performance Space. Bookmark the permalink.